Can a story be a sonnet? Can a sonnet be a Dear John letter? Find out today, and any other day since it was published, in Nichole LeFebvre’s story in Vol. 1 Brooklyn. Phantom Drift, the close cousin of ghost riding the whip, is also a journal, and that journal has published Stephen Langlois story “Another Eddie Altogether.” Do I recommend reading Phantom Drift while phantom drifting? I don’t NOT recommend it. Brian Warfield has a story published in Pank. Brian Warfield had his first book published as well, Beach Story. Brian Warfield stock is up. Way up. Buy that Brian Warfield stock. Or else. A new apartment can be a terrifying place. Kayla Haas explains at The Butter. Go on and check out some stories and an interview with Leesa Cross-Smith at the Atticus Review. Do we have other news about Leesa? We do. Maybe later though. Chase Burke is all up in Perversion Magazine with the story Not on the Run. Look at Rachael Katz, with stories and interviews and pictures all over Awst Press. Literally, go look at her. Oh also a book trailer for the chapbook Pony at the Super. Brothers are the best, so here is a story from Kara Vernor in Pamplemousse with some brother action. Listen to Justin Brouckaert, he’s a cool dude. Or just read his words in an interview at Midwestern Gothic. There aren’t many things you can buy for a penny, but Will Kaufman knows basically all of them, because he wrote a story called “Things You Can Buy for a Penny” and it’s a real good how-to guide or something what am I even doing here. I was lucky enough to see LaTanya McQueen at AWP after an absence of several long years. You’ll be lucky enough to read her upcoming essay, “Violin Dreams”, in Grist. Brandi Wells has a novella “This Boring Apocalypse” and holy moly just reading the little selection available through that link is *turns into mush*. Kara Vernor’s story in Whiskeypaper starts with some dialogue. Oh and that dialogue is “She threw a beer at my head.” Oh and also the story is titled It’s Hard Out Here for a Pimp. “Not on the Run” is a story by Chase Burke due out soon in Perversion Magazine. You should be on the run to pick it up. I’ll boo myself off stage. Leesa Cross-Smith has her story “Whiskey & Ribbons” in Paragraph by way of Carve Magazine. The story is so good that even the comments section is entirely positive and well-written. Here is a story written from the POV of an Elite Male Models employee. By Matt Tompkins. Is he writing from experience, because he is an Elite Male Model? I don’t know. You tell me genius. Tally Brennan, who writes as well as she reads (for Gigantic Sequins!) had her story “The Original” published by Epiphany magazine and also read at the Fiction Center in NYC in December. Upcoming in Lightspeed, Will Kaufman has a story that may or may not be titled “Things You Can Buy for a Penny”. “The Turkey Rumble” is a thing that Kate Folk has written about for Word Riot and will be available for all of our eyes in February. Come for the tooth art, stay for the story from William VanDenBerg. Chicago! 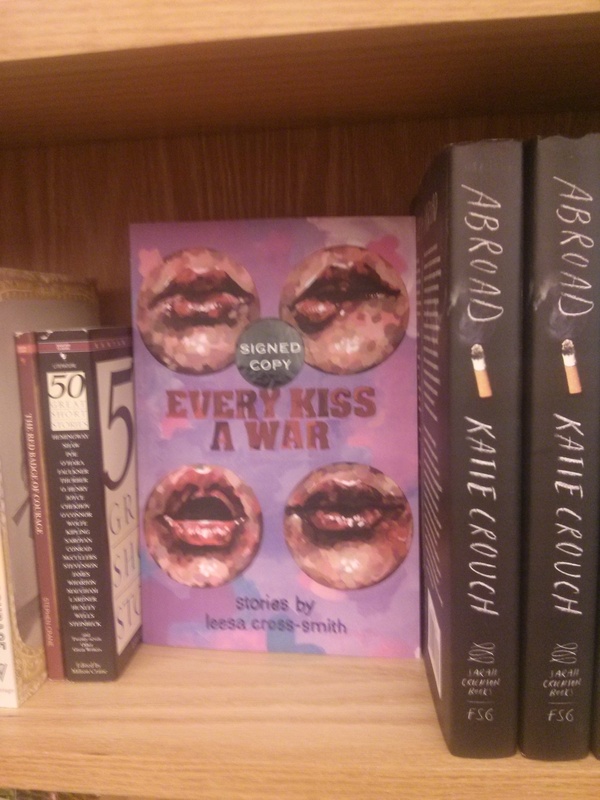 Pick up a signed copy of “Every Kiss a War” by Leesa Cross-Smith at City Lit books in Logan Square. Remember, Santa is watching. If you like stories (which, duh) and also stories with amazing illustrations, GOOD NEWS. Kayla Haas has a story at Story Shack that will check both those boxes. Michelle E. Crouch just writing about tattoos. Driftless Review has an upcoming story from Kate Folk. Has Kate been nominated for a Pushcart Prize recently? Oh yes, yes she has. “The Going Things” is a story that will soon be in Southern Humanities Review. Andrew Payton wrote this story. How do three stories sound? What if they’re by Kara Vernor in Atticus Review? LaTanya McQueen, who once had to work near me at Borders (RIP BORDERS), has an essay in Portland Review. Let Chase Burke break your heart in one paragraph at Tupelo Quarterly.